Fairies are a staple presence in the folk tales of many cultures but evidence of their existence only borders the anecdotal. And then these challenging photos surface, sprinkling our imagination with (what else?) fairy dust. In the spring of 2015, the hosts of The Mystic Menagerie, a UK-based podcast dedicated to alternative arts were contacted by one of their regular listeners. Since the podcast’s usual topics included events of the paranormal kind and strange folklore, the listener felt he could share a strange discovery he had recently made. Despite addressing his issue to the right crowd, the man who sent the photos chose to remain anonymous, fearing that he might be ridiculed for his highly unusual find. As you can see, the images show a pint-sized incomplete humanoid skeleton, consisting of a skull, spine and several ribs. The rest is missing but there’s more than enough to build a disturbing case. Before its death, this humanoid could easily have fit inside the palm of your hand. 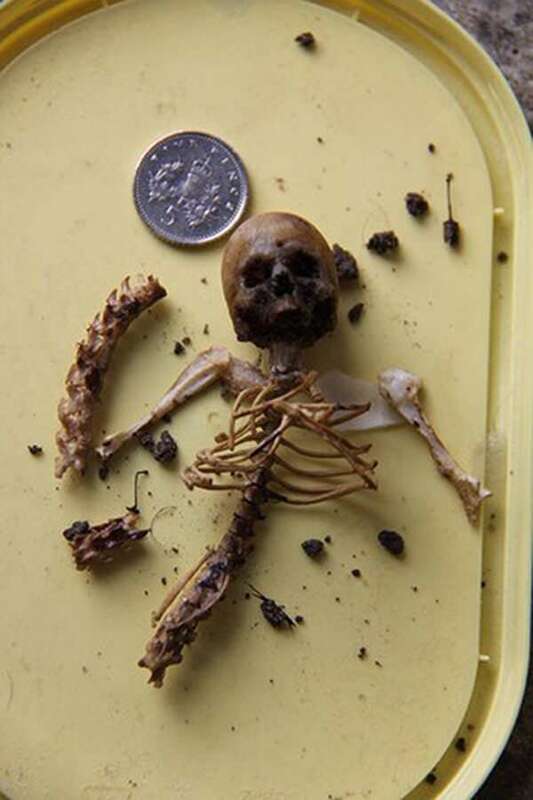 The images show a familiar figure despite its unfamiliar scale: a diminutive humanoid skeleton complete with a skull, a spine and a partial rib cage. While the limbs, lower jaw and pelvis are missing, enough remains to paint a disturbing picture and build an unsettling case. The unnamed British tipster told the hosts of the Mystic Menagerie that he worked for a bird rescue center located in Cornwall and his job was to keep tabs on the nests of endangered bird species in the area and protect them from egg poachers. That’s a thing so stop snickering! 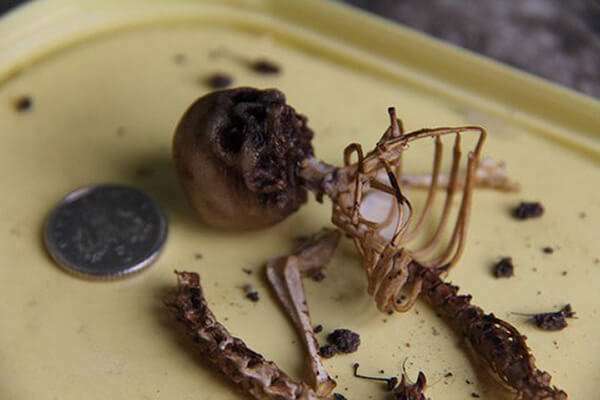 It was during one of his routine checks that the man happened upon this Lilliputian carcass amid the twigs and feathers lining the inside of a falcon nest. What a surprise it must have been! The man said that after regaining his composure, he carefully gathered the remains in a sample bag and brought them to the rescue center for a closer inspection and a second opinion, maybe to confirm he wasn’t seeing things. At this point we should mention that Cornish folklore is rife with stories about fairies or pixies and accounts of encounters with these mystical creatures stretch back thousands of years. Can this discovery get a bump in credibility because of these legends and more importantly, were the legends inspired by a race of tiny humanoids made of flesh and blood? 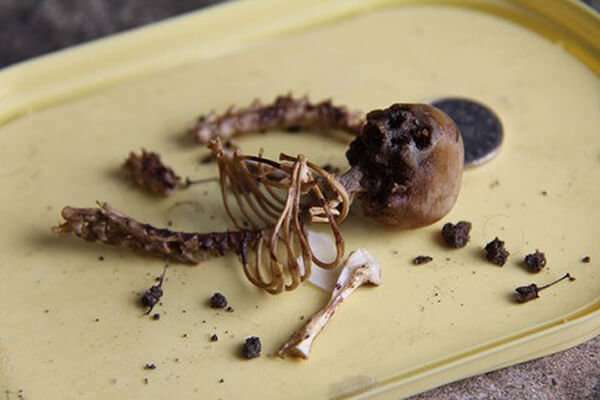 Before allowing ourselves to muse over the finding, we should note that one of the show’s hosts was none other than sculptor and designer of illusions Dan Baines, the author of the Mummified Fairy Hoax, an April Fool’s day prank that escalated to unexpected proportions. If there’s someone who knows fakes, it must be him. But Baines denies having any involvement with these remnants whatsoever. In fact, he swears he had nothing to do with it. The Mystic Menagerie’s two hosts said they were planning to meet up with the man and get a chance to examine the pint-sized skeleton. Let’s hope they end up performing a battery of tests and maybe shed some light on this minute mystery with a rich history. 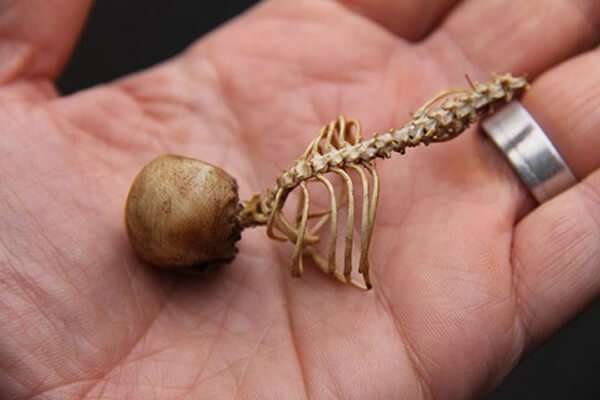 There is some controversy over this article, possibly it's a hoax..and just a artistic creation only portrayed as a pixie..the body could be a rats or rodents,and the head made from resin..